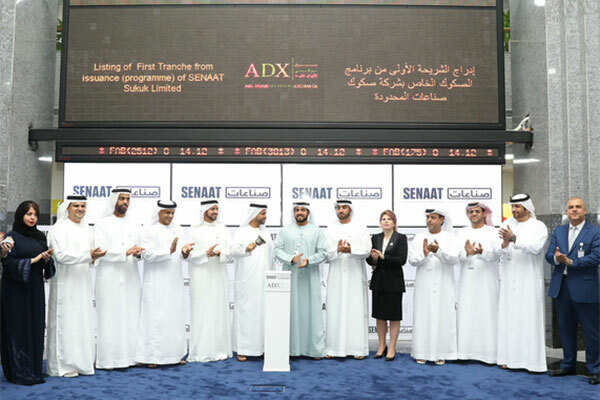 The Abu Dhabi Securities Exchange (ADX) and General Holding Corporation, Senaat, yesterday (December 9) rang the market opening bell to celebrate the listing of the first tranche of Senaat sukuk. Valued at $300 million (Dh1.1 billion), it is the first of its kind dual listing between the Abu Dhabi Securities Exchange and London Stock Exchange, reported Emirates news agency Wam. The sukuk was raised at a profit rate of 4.76 per cent with a seven-year tenure, backed by an Obligor Rating of A3 (stable) by Moody’s and A (stable) by Fitch issued last week. The issuance, listed on ADX under the code XSSenaat1225, witnessed exceptional demand from over 180 local and global investors, exceeding the coverage ratio by almost 10 folds. Khaleefa Al Mansouri, acting chief executive of ADX, Jamal Salem Al Dhaheri, CEO of Senaat, alongside senior management of the corporation attended the bell ringing ceremony of the dual listing with London Stock Exchange. Al Mansouri said: "This listing reaffirms ADX’s position as a leading market in the region and as a preferred destination for listings, thanks to the confidence it provides. The market is capable of listing fixed-income securities and adopts an advanced system of settlement and clearing. ADX also has an outstanding infrastructure for listing diversified securities, giving investors the opportunity to invest their savings in a legal environment that adheres to global best practices in disclosure, transparency and provides a stable economic and regulatory environment." Al Dhaheri added: "The listing of the Sukuk on the Abu Dhabi Securities Exchange is an important milestone in the company's history. This is the first time the company has entered the public markets to issue Sukuk that can be traded in one of the world's leading financial markets. “This is a confirmation of the strong performance and progress achieved by the company, which is in line with our goals and future strategies. As one of the largest holding companies in the field of industrial investment in the UAE, we have a strong financial position that enhances our self-sufficiency and strengthens the confidence of lenders in supporting our development plans. The exceptional demand by the broad investor base, supported by high obligor ratings from Moody's and Fitch, reflects our strength and competitiveness, as well as the low risk of the new Sukuk." This listing is the third of its kind this year on ADX. In October, Aldar Investment Properties LLC Sukuk was listed jointly with the Irish Stock Exchange. While in May of this year, ADX listed sovereign bonds issued by the Ministry of Finance and The Maldives Ministry of Finance and Treasury on behalf of the Government of Maldives for the Abu Dhabi Fund for Development, the first of its kind in the UAE and the region.